President Barack Obama’s decision to grant amnesty and work permits to as many as 5 million illegal immigrants creates a loophole that makes them $3,000 more attractive than native born and naturalized Americans, according to the Washington Times. In other words, from an employer’s standpoint, hiring someone from Obama’s 5 million-strong amnesty pool means getting an exemption from the $3,000 fine. So, not only are illegal immigrants covered by Obama’s amnesty skipping ahead of people trying to immigrate legally, they’re now also equivalent to a get-out-of-fines-free card when compared to all the workers already here. For political junkies, the news that MIT professor and ObamaCare architect Jonathan Gruber has agreed to testify before the House Government Oversight and Reform Committee is must see TV. Gruber has stirred up a hornet’s nest of negative press for the controversial health care law because of statements he’s made at academic conferences over the last few years. Helpfully summarized by the folks at American Commitment, Gruber’s comments include calling American voters stupid and admitting to writing ObamaCare’s text in a tortured way to avoid a straightforward cost estimate from the Congressional Budget Office. Also appearing at the hearing will be Marilyn Tavener, administrator of the Centers for Medicare and Medicaid Services, to explain – presumably with a straight face – why revelations that ObamaCare’s reported enrollment of 7 million inexplicably counted 400,000 dental plans. Republicans suspect a bad faith face-saving move since without the incorrectly included dental plans enrollment would have failed to reach CBO’s benchmark estimate. All in all, December 9, 2014 should be an entertaining day in Washington, D.C. – if you like to watch contentious oversight hearings. 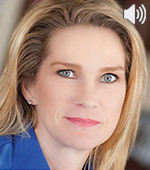 In an interview with CFIF, True the Vote founder Catherine Engelbrecht discusses a federal judge’s decision to dismiss the lawsuit filed by True the Vote against the Internal Revenue Service for targeting the conservative organization and improperly delaying its application for tax-exempt status, how liberals are attempting to silence their critics, and the status of election integrity. Who better than a former federal prosecutor to judge whether President Barack Obama can unilaterally impose amnesty for illegal immigrants via “prosecutorial discretion”? 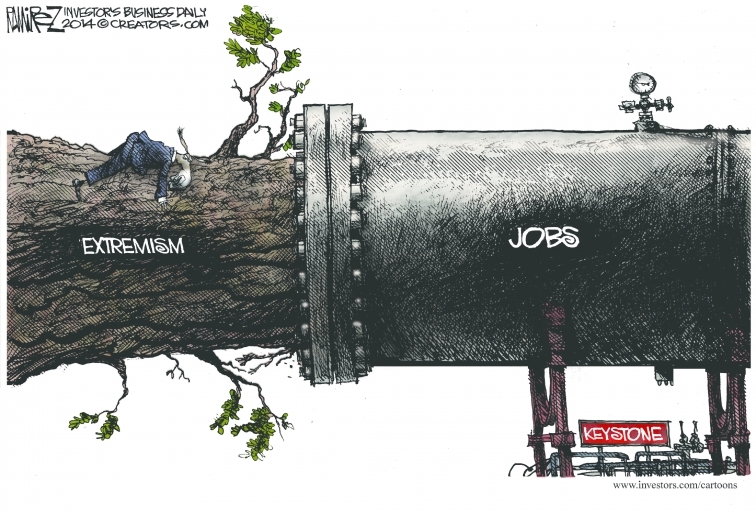 Yet that’s just what President Obama is proposing. 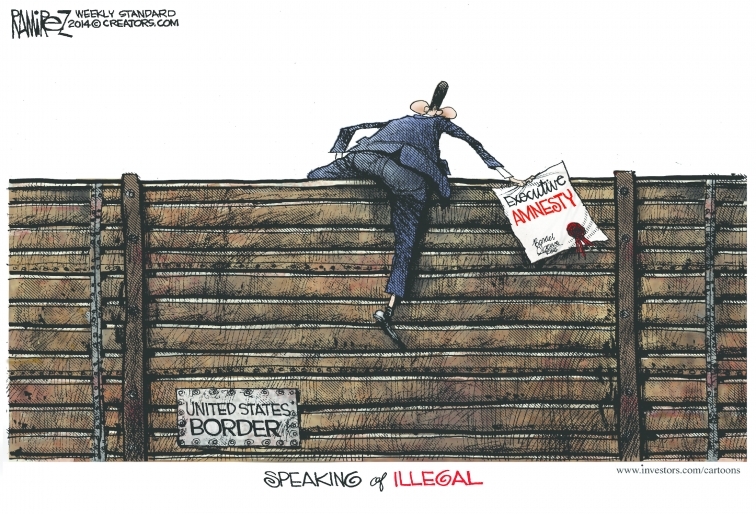 In other words, Obama’s amnesty perverts prosecutorial discretion beyond recognition. Thursday, November 20, 2014, could be a day of infamy if President Barack Obama follows through on indications he will act on his own to give some form of legal status to as many as five million illegal immigrants. Some conservatives say liberals can’t defend Obama’s lawless action, but there is no consensus among the former on what to do if the president intentionally violates his duty to faithfully execute the law. 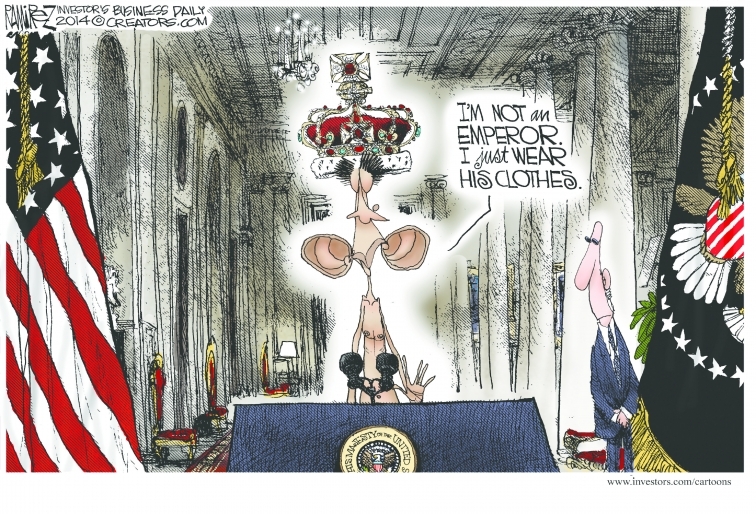 Charles Cooke of National Review cautions against adopting The Obama Rule – picking and choosing which law a president will enforce – when the GOP next controls the White House. Among other things, doing so would forever obliterate the Republican claim to defend the Constitution and the principles it preserves. Of course, all of this could be avoided if a certain former constitutional law professor would step back from the precipice. A little self-restraint would go a long way toward reestablishing appropriate boundaries on what the most powerful man in the world can, and cannot, do. If so, then tomorrow won’t go down as the day The Obama Rule officially replaced the Rule of Law. Fifty-six percent of Americans disapprove of ObamaCare, the highest number disapproving of the controversial health care law since Gallup began asking the question. Approval of ObamaCare peaked just before the 2012 presidential election, but has cratered since then. In other words, the law has continued to grow less popular with each new revelation that it was sold on a pack of lies. Though completely repealing the entire law seems unlikely because the new Republican Senate majority is less than the number needed to overcome a certain Obama veto, the increasing levels of voter disapproval could convince some Senate Democrats to join Republicans in dismantling large parts. Unless, that is, they want to risk involuntary retirement when their next election arrives. We’ve written extensively on the destructive nature of illegal online piracy, as well as various market and legal avenues to combat it. In positive news this week, the Motion Picture Association of America launched WhereToWatch.com, a one-stop-shop for consumers to locate legal sites for their favorite films and television shows. Visitors to the site can (1) search for films and shows on digital downloading and streaming sites, as well as at stores and kiosks; (2) quickly and easily find theater times and locations for new movies; (3) watch trailers and access original behind-the-scenes content; and (4) create settings to receive alerts when movies and shows they want become available from various providers. Studies show that almost 95% of popular films and shows are already legally available for viewing, via over 100 legal online services across the U.S. Accordingly, there’s simply no need or excuse for anyone to steal the films or TV shows they enjoy on illegal sites, when legal alternatives are now so readily available. In that vein, WhereToWatch.com offers a welcome innovation. The 2010 BP oil spill in the Gulf of Mexico is by now a fading memory for most Americans. The U.S. Supreme Court, however, will soon decide whether to hear a case stemming from the spill that could, at long last, restrain abusive trial lawyers who game our legal system. The case involves BP, which immediately accepted responsibility for the spill and asked attorney Kenneth Feinberg to handle claims on a rapid and completely independent basis. Ultimately, Feinberg ordered more than 200,000 payments totaling $6 billion over 16 months. The problem at issue arose when opportunistic plaintiffs’ lawyers decided that they weren’t receiving their customary windfall. Consequently, they rushed to court and demanded a class-action settlement, which a federal district court in Louisiana granted. Then the court appointed a well-connected local Louisiana lawyer to administer claims for what are broadly categorized as “business economic losses.” For example, a restaurant owner on the coast could demonstrate damages by comparing pre-spill revenues and profits versus post-spill revenues and profits. Victims who could establish a decline in revenues and confirm a causal connection between the losses and the spill itself, were entitled to payment. A real estate rental company that leased properties to two Saturn dealerships, which both went out of business because GM stopped making Saturns in 2009, put in a claim and received $238,000. A group of emergency room physicians received $2.3 million after claiming that revenues dropped sharply, but that decline resulted not from the spill, but from a one-time earnings adjustment to accounts receivable over a period of five years. So why should informed citizens care? After all, BP admitted to doing great damage to the Gulf of Mexico. We should care because if the abusive and greedy plaintiffs’ lawyers triumph in this case, few restraints will remain. If ever there was an example of discarding the rule of law in favor of enriching a politically-powerful group, this case is it. Unfortunately, different federal courts of appeal have ruled inconsistently in similar cases. That inconsistency alone constitutes one reason the Supreme Court could and should accept the case. Another reason is the important and fundamental legal issue at stake: people who haven’t suffered actual harm should not receive unjustified windfall damages. Whatever one thinks of BP, the case now before the Supreme Court is a critical one, and its legal position is the correct one. Accordingly, the Justices should take the important step of granting cert. 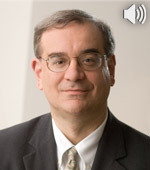 In an interview with CFIF, Mark Krikorian, Executive Director of the Center for Immigration Studies, discusses President Obama’s refusal to wait for Congress to act on immigration, why proposed executive action presents a separation of powers issue, and what legal challenges and other remedies may await the Obama’s Amnesty decree.